I’ll admit it – this is not going to be a long treatise on birdwatching in the region. Suffice it to say that wherever you go in the region, given time and patience you’ll see something interesting in the air or on the ground and covered in feathers, whether you are a devoted twitcher or an ordinary Joe like me who takes pleasure in watching whatever nature is offering around me at the time. Here at La Basse Cour we have spotted almost 60 different species in our own garden. Some are regular visitors to the garden in winter, when we have multiple feeders set up in the back garden, others nest and breed here every year, and many others are transient visitors who stop off to feed on their annual migrations. La Basse Cour’s gardens are designed to encourage wildlife – we avoid chemicals in the garden, we hang bird feeders in winter and we provide nest boxes as well as allowing swallows, swifts, sparrows, starlings and redstarts to nest in the eaves, nooks and crannies of our outbuildings. Mallards, little grebes and moorhens make their homes in the bullrushes and reed beds we have planted around the substantial pond of 3000m² that we restored in 2007, and on the long, warm days of summer and early autumn (well into September) the surface of this little lake is abuzz with dragonflies. Bats are regular visitors and can be seen feeding on the wing at twilight from spring to autumn and occasionally in winter. They are allowed to roost in all of our barns and in 2010 we built and installed a bat box on the south wall of the main barn. La Basse Cour is a designated LPO Bird Sanctuary. 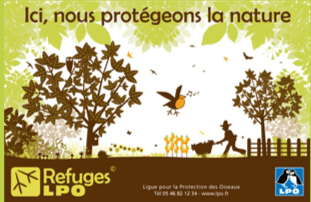 The LPO is the ‘Ligue pour la Protection des Oiseaux’, the French equivalent of the British Royal Society for the Protection of Birds. There are several wildflower areas and all parts of the garden are managed to encourage bees and other insect life. Resident toads and hedgehogs keep down the slug and snail populations. Our waterside copse of mixed trees (alder, birch, elder, oak) and the specially planted native hedgerows provide food and cover for blackbirds and thrushes, whilst walnuts and hazelnuts are left for the wildlife to forage (these include native red squirrels). bird reserve of Gros Banc near Salanelles maison de la Nature near Caen and Ouistreham ferry ports. It was good last winter for waders and wildfowl and raptors plus passerines with Nightingales, Marsh Warblers and Bluethroats breeding in summer with Fan-tailed Warblers which coast alongside breeding Avocets and summering Great White Egrets with visiting Spoonbills and breeding Kentish Plovers. An Audouins Gull was seen recently and Caspian Terns turn up in autumn at Mereville-Franceville with the summering Little Terns.For further details llook up FORUM of http://www.surfbirds.com Bertram.E.B.BREE of CRBPO and LPO.